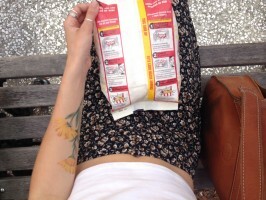 The perfect Saturday afternoon: buttered popcorn and the big screen. 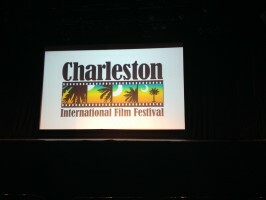 Day 4 of the Charleston International Film Festival was bound to draw in a large crowd. A blissful spring morning at the reopening of the Saturday Farmers Market in Marion Square complimented by an evening at the movies is too good to pass up. In order to seat the larger weekend crowd, the festival moved into the Charleston Music Hall. 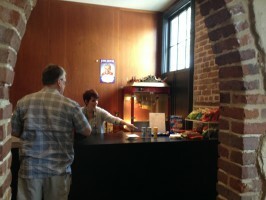 Viewers entered the lobby surrounded by colorful merchandise, tantalizing refreshments, and eager filmmakers. Directors and Producers flocked from around the nation. Winners stood alongside Young Filmmakers and complimented each others work. A particular draw to Saturday’s showings were the documentaries. Access to untold lives and ideas of makers and lovers from around the nation captivated every eye. “Free Art 4 U,” a film highlighting a project of hiding free art in the streets of Atlanta, encouraged local artists to embellish their streets with free art. A friend and I proceeded to pick up one of the handmade pieces from the lobby to hide in the streets of Charleston. Continue this incredibly movement by searching out pieces and marketing them on social media! There were no dry eyes after the presentation of “Sands of Time.” Following the intense story of two lovers struggling with an intense disease, the film highlights the importance of adjusting to life and determination. The two lovers defied all odds in living as long as they have, and then went further by falling in love with one another. The insight into the family’s thoughts and care for their son touched everyone in the audience. After tears, laughter, and quizzical brows, it was time to unwind at the after party. The Music Farm blazed with flashing lights, live music, and good spirits. Filmmakers and viewers alike gathered to celebrate the artistry that had gathered in Charleston…and to party. Posted on April 14, 2014 by admin.